Stephenson Quarter is fast becoming the place to be in Newcastle. The area behind Central Station has gained a foodie following thanks to the Boiler Shop Steamer (closed for refurbishment – come back soon please!) and last year welcomed the Crowne Plaza hotel to the Toon. 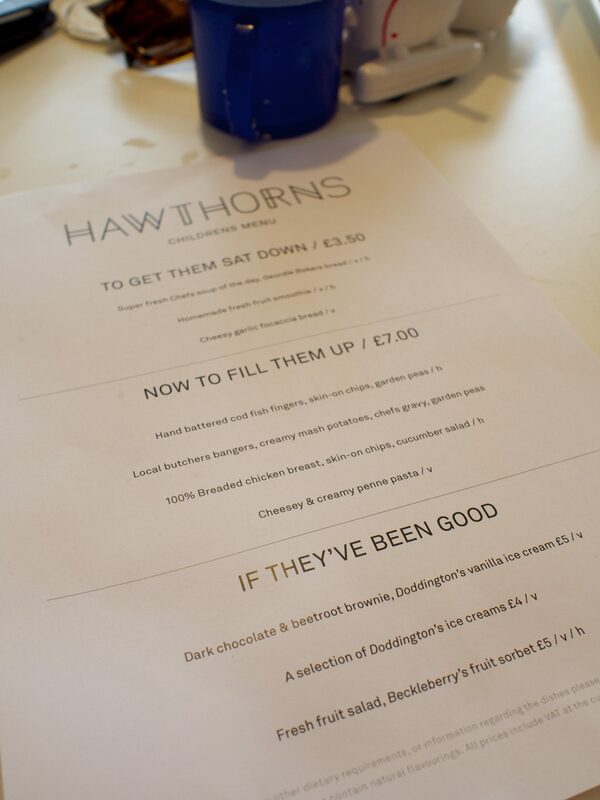 Keen to embrace local traditions and ingredients, their restaurant Hawthorns is independently owned and operated, with leading chef Chris Wood (formerly of Apartment Group and Alnwick Treehouse) at the helm. JG, Little Dude and I were seated in a plush velvet-upholstered booth in the restaurant, which flows on from the main lobby when you enter the sleek, glass-fronted hotel. Feeling a little under dressed as we were surrounded by suit-clad businessmen we were soon put at ease by the friendly waiter who explained the menu to us. 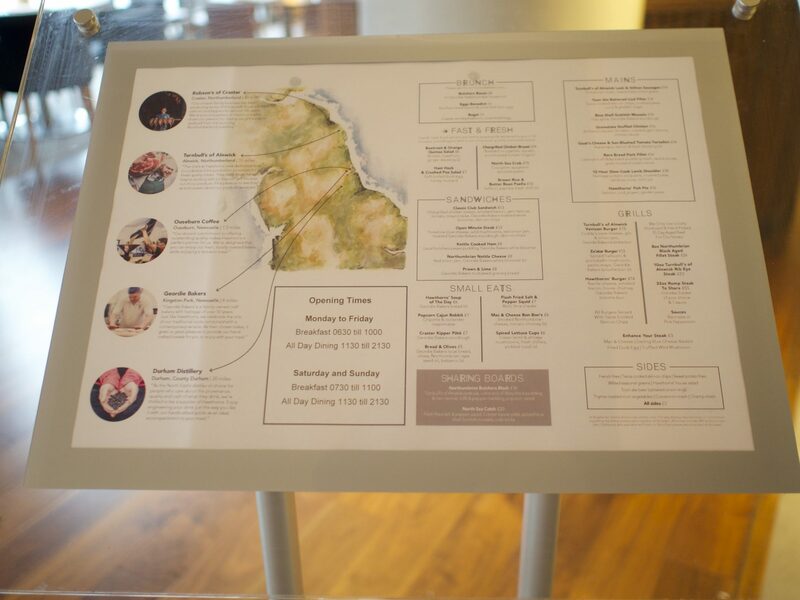 A map of the North East highlights the local suppliers including meat from Turnbull’s of Alnwick, Robsons of Craster kippers and Geordie Bakers bread. 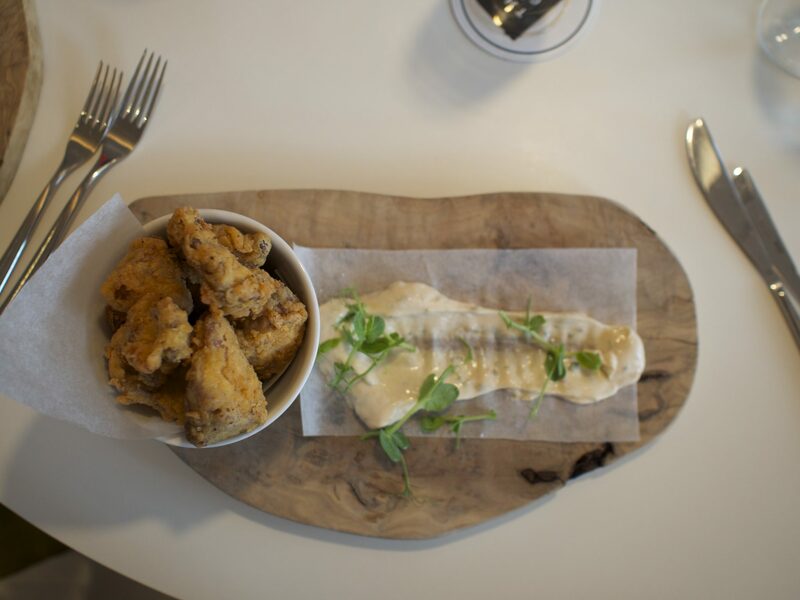 With the usual crowd pleasers like fish & chips (in a Toon ale batter, which is a nice touch) and a variety of steaks it also contains some more adventurous options, and we couldn’t wait to get stuck in. A separate children’s menu was presented to Little Dude, with the option of crayons to colour in the local landmarks on the back. Little Dude made a beeline for the plush velvet banquette, clambering onto it and peeking over the top at the people at the next table. Luckily everyone loves a cute toddler, so after a quick game of peekaboo I got out my bag full of distractions so JG and I could talk wedding prep. After much debate we decided to share starters/’light bites’ and plumped for Craster Kipper Pate served with Geordie Bakers Sour Dough (£7) and Popcorn Cajun Rabbit served with Chipotle & Coriander Mayonnaise (£7), whilst LD went for Cheesy Garlic Focaccia Bread (£3.50) from the children’s menu. We were intrigued by the posh version of KFC, and the popcorn rabbit didn’t disappoint. The meat was melt in the mouth tender, seasoned just so and covered in crisp batter. With a swipe of chipotle mayonnaise it was deliciously moreish. “If KFC was like this I’d eat there all the time” proclaimed JC. If only it was! Even LD had a bite and was delighted. 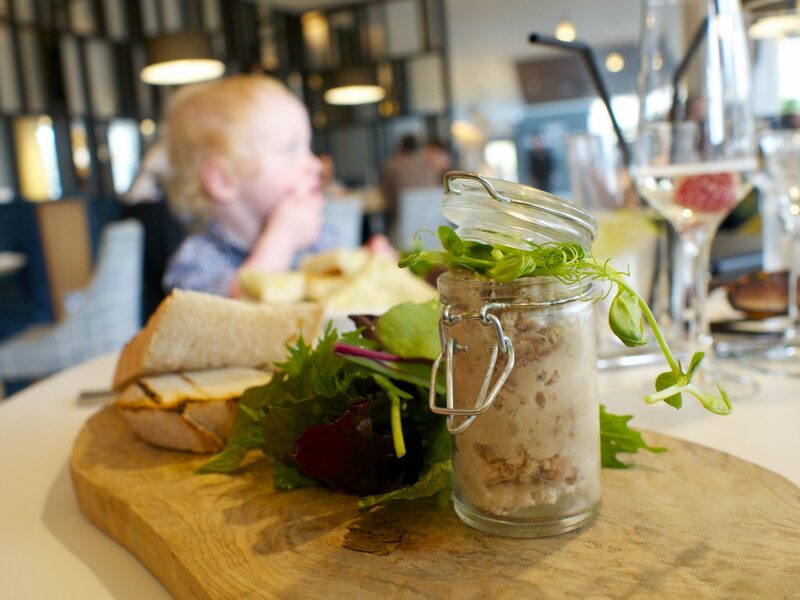 The Craster kipper pate came in a little jar with a couple of good chunks of toasted sourdough and some salad leaves on the side. Diving in, the smokiness immediately brought me back to the last time we visited Craster. Good chunks of kipper bound together and smothered on toast, pretty much my idea of heaven. LD was meanwhile munching away on his cheesy bread, doing his happy dance in his high chair. 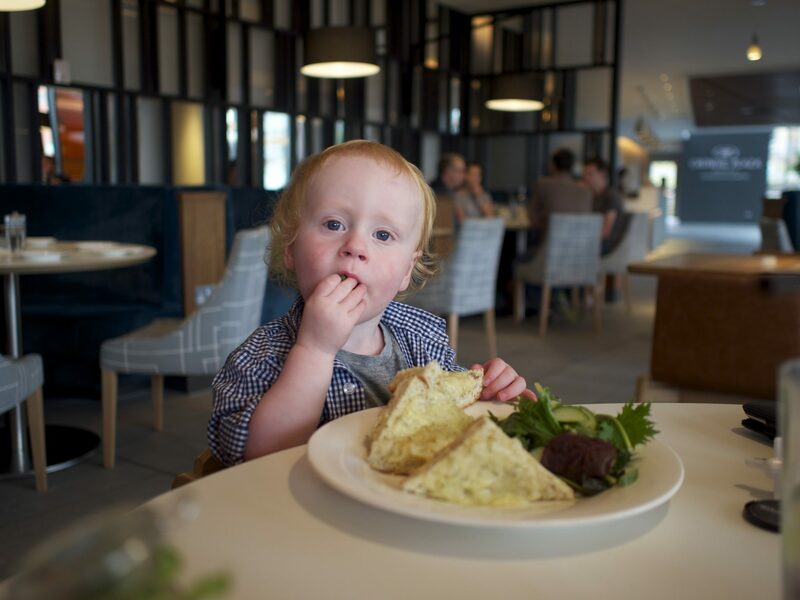 After a quick run around the restaurant, delighting in the fact he could see into the clear glass lift and that his shrieks travelled the length and breadth of the hotel thanks to great acoustics, LD came back to the table to check out our mains. JG went for Rare Breed Pork Fillet served with Lishman’s of Ilkley Black Pudding Mash, Apple Puree, Grain Mustard Cream Sauce (£16) and I decided to go for a Turnbull’s of Alnwick Venison Burger served with Cuddy’s Cave Cheese, Gin & Onion Jam, Geordie Bakers brioche bun (£15), while LD settled on Cheesy and Creamy Penne Pasta (£7). 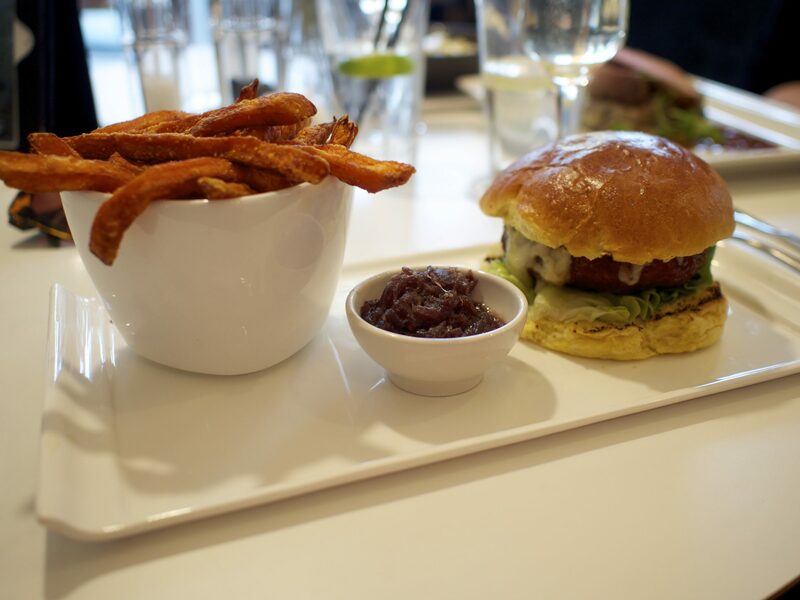 The helpful staff gave me the option of substituting the twice cooked chunky chips that came with my burger for fries or sweet potato fries and I went for the latter. That makes it healthier right? The burger was juicy and satisfying, well seasoned and a nice change from beef. It didn’t taste as game-y as Venison normally does, good for those who fancy a change but don’t want to be too adventurous. It was topped with a nice melted chunk of cheese from Doddington Dairy, some fantastically tangy chutney and the obligatory brioche bun. The fries were crisp and delicious, and LD soon stole a couple. JG was in raptures over her black pudding mash. “Here you have to try this” she said thrusting a fork at my mouth. She also enjoyed her pork, which chef recommended they serve pink in the middle. The Mr was horrified when I told him, warning of the dangers of undercooked pork. It’s a debate that rages on between health inspectors and foodies, with those in the know stating that it is a similar risk to eating a runny egg but the Mr remains cautious. Anyway I digress – the pork and mash went down a treat, and so did the cheesy pasta which LD enjoyed alongside some of my fries. 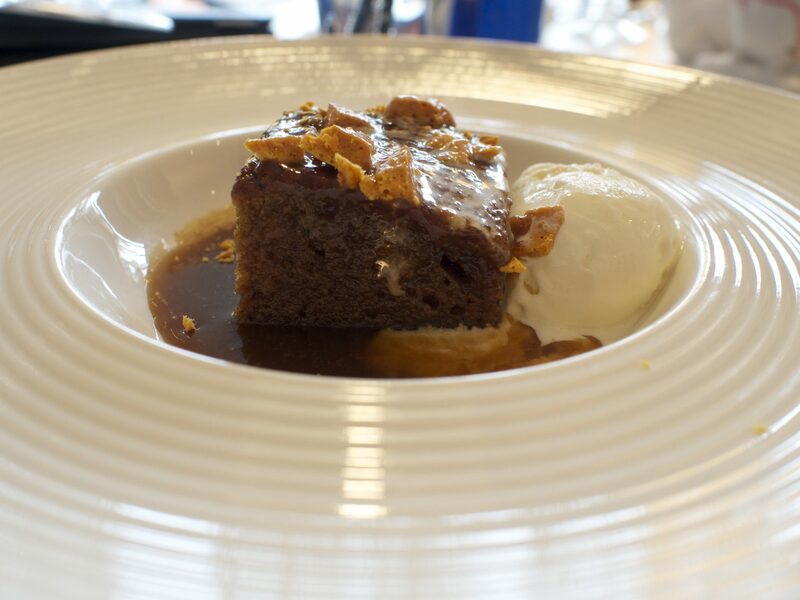 We finished things off with Sticky Toffee Pudding served with Butterscotch Sauce, Doddington’s Heather Honey Vanilla Ice Cream (£7), West Yorkshire Rhubarb Cheesecake (£7) and Fresh fruit salad served with Beckleberry’s fruit sorbet (£5) for the little guy. Meanwhile LD had decided it was far more fun to stick his dinosaur stickers all over JG rather than in his book. The sticky toffee that the waiter had recommended was as it should be, with hints of date and a gooey toffee sauce. The cinder toffee chips that topped it and creamy vanilla ice cream were the perfect accompaniment. 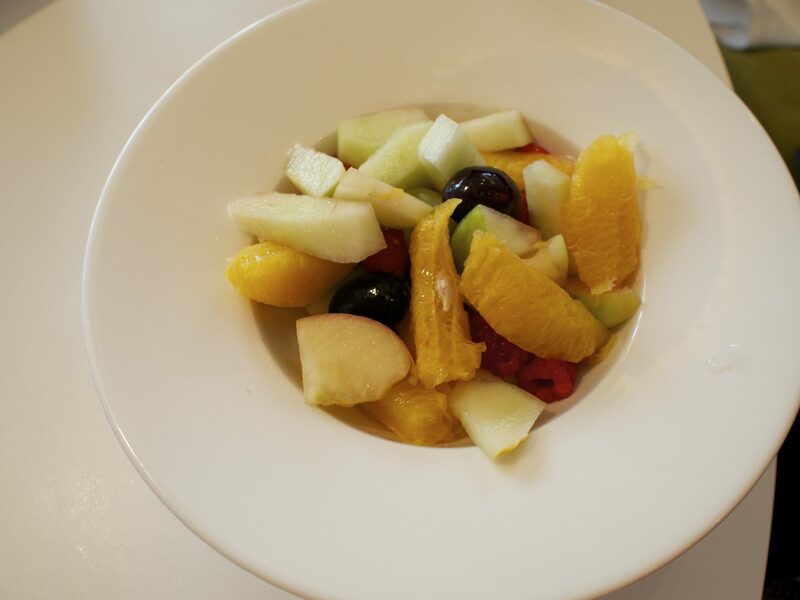 Unfortunately LD’s delicious looking fruit salad was missing the Beckleberry’s sorbet so the apologetic waitress took it back to the kitchen. It took rather a while to come back and in that space of time LD managed to eat most of my sticky toffee pudding. 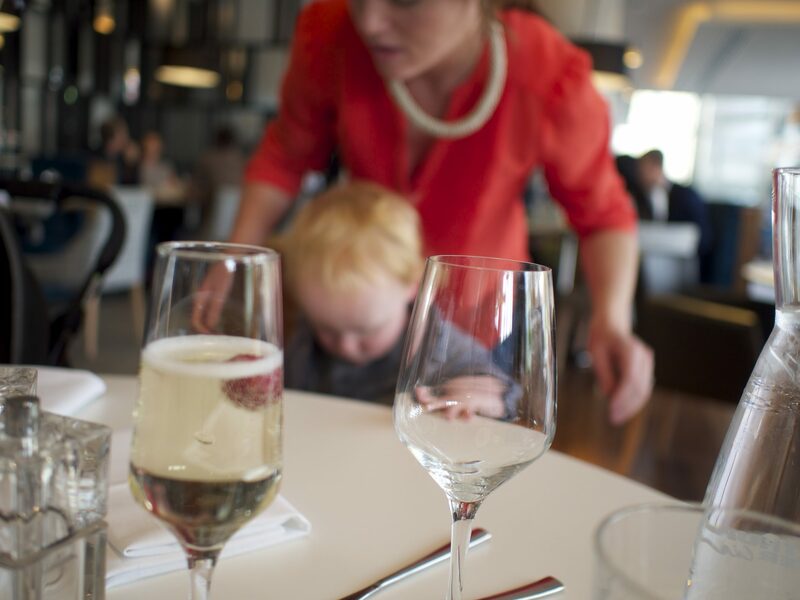 Turns out toddlers are even more impatient than bloggers…. The rhubarb cheesecake was artistically presented with dollops of rhubarb compote and vanilla cream and bits of rhubarb, which JG kindly presented to LD. “Do you want to try the rhubarb?” Was met with a defiant chucking on the floor of said rhubarb. God loves a trier! 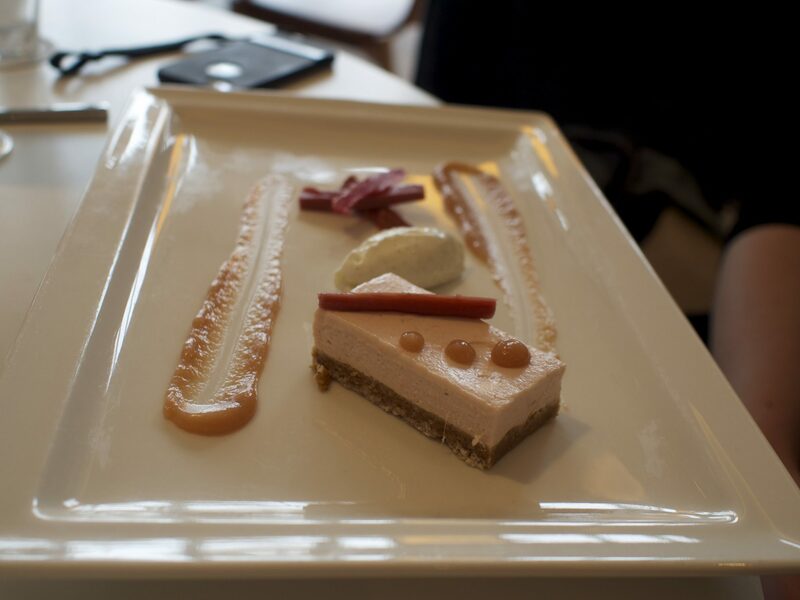 The cheesecake itself was enjoyed immensely by JG, with a buttery base and creamy layer with delicate rhubarb flavouring. LD’s desert returned and we decided to try some of his sorbet, which was delicious and the fruit salad was fresh, varied and more than enough for a 12 year old, let alone a toddler. LD was by now extremely ready for a nap and letting the whole restaurant know about it so we said our goodbyes and headed out into the rain-soaked streets of Newcastle. 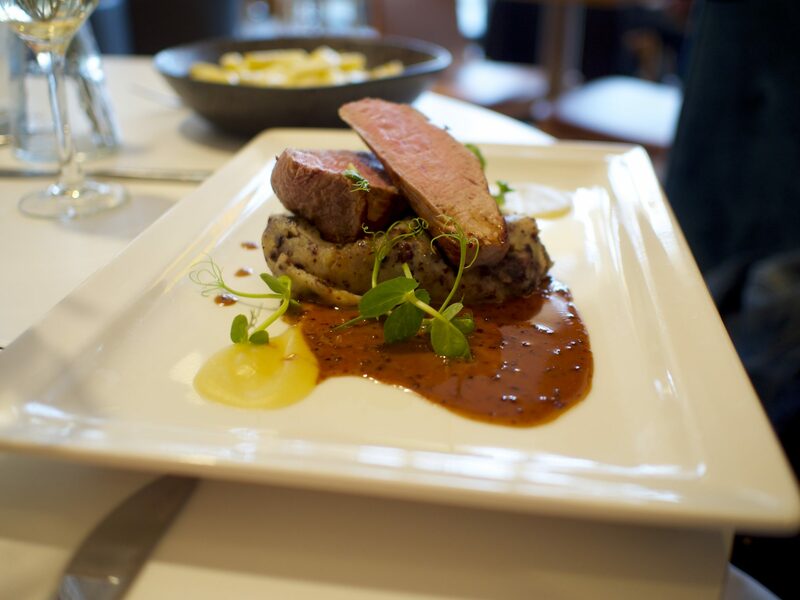 We would recommend Hawthorns for a leisurely lunch or dinner. Service was relaxed and friendly and the food was well executed. 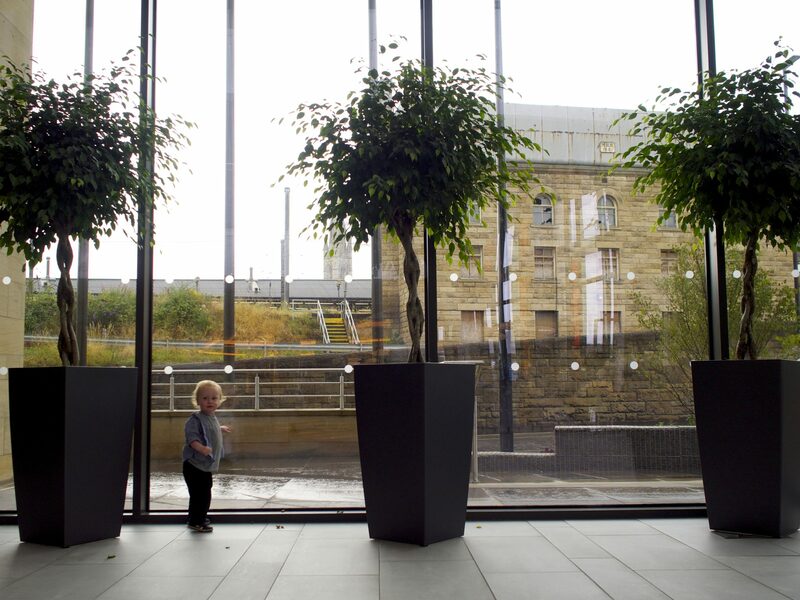 We will be back to try out the Gin Bar next door – minus the Little Dude! Hawthorns is located in Crowne Plaza, Hawthorn Square, Forth street, Newcastle upon Tyne, NE1 3SA. They are taking part in NE1 Restaurant Week which ends this Sunday 14th August. JG and I were provided with a complimentary meal for the purposes of this review. However the opinions expressed in this article are honest and true to experience.